Chuck and Mike welcomed Richard Flamer to the show. Richard Flamer delivered a stirring commentary from south of the border, more specifically at the Chiapas Project in San Cristobal de Las Casas, Mexico. He founded and still runs a Catholic Worker Farm there, and we are lucky to have him share some of his experiences each month.Richard discussed the plight of a boy, born in the US but living in Mexico with his father, who wants to return to the land of his birth. The “legal” and financial complications have been extremely challenging. 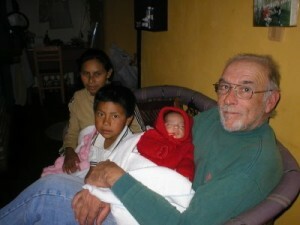 Richard, and the whole community at the Chiapas Project, are trying to help out.